Sun City Shadow Hills- Castellano. Recently upgraded AC, recirculating hot water & water softener! There is noticeable curb appeal with this corner lot location. A gated front courtyard w/fountain & stamped concrete hardscape lead to a leaded glass front door. 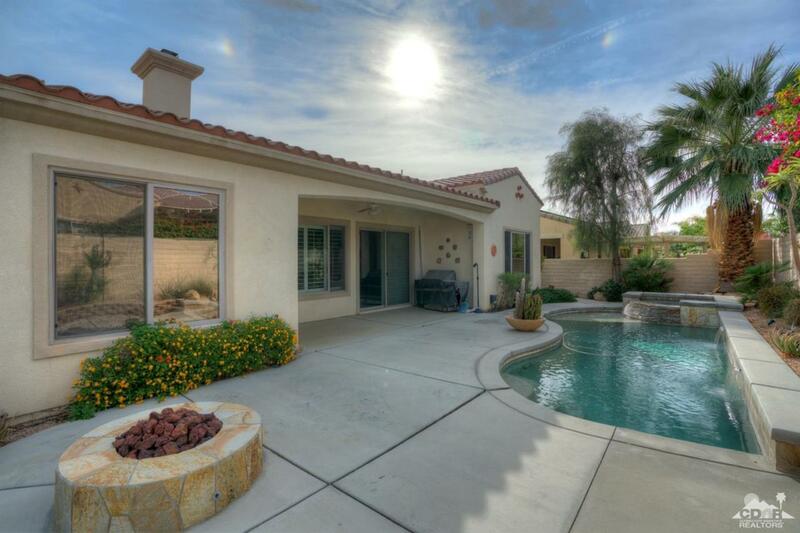 The private rear yard has a beautiful pool & spa, spacious patio & gas firepit. Inside, tile flooring is used extensively. The greatroom has a gas fireplace & custom builtin media center. The kitchen has maple cabinetry cabinets w/pullout shelves, stainless appliances including double wall oven, slab granite counters and recessed lighting. A formal dining, private den/office & large guest suite makes the home perfect for entertaining & guests. The large master suite has shutters & a huge walkin closet. The master bath has dual sinks, a stall shower & oversized hub. A pedestal sink is in the powderroom. The laundry room has abundant builtin storage & utility sink. The 2+ golf cart garage has room for ample storage. Listing provided courtesy of Michael Horne of Coldwell Banker Res. Brokerage.